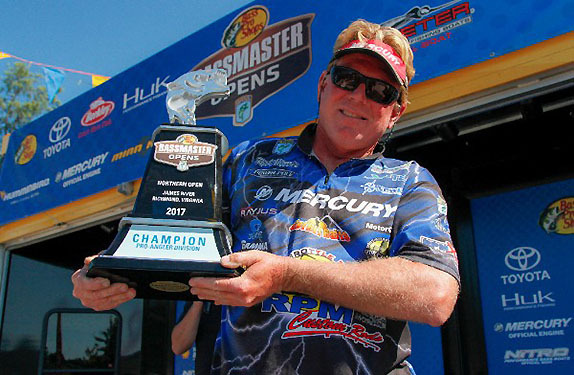 Rick Morris' victory at the James River Bassmaster Northern Open earned him his sixth career Bassmaster Classic berth. Rick Morris has spent a lot of time on the James River over the past three decades, and last week he took full advantage of that experience to win the second Bassmaster Northern Open of 2015. 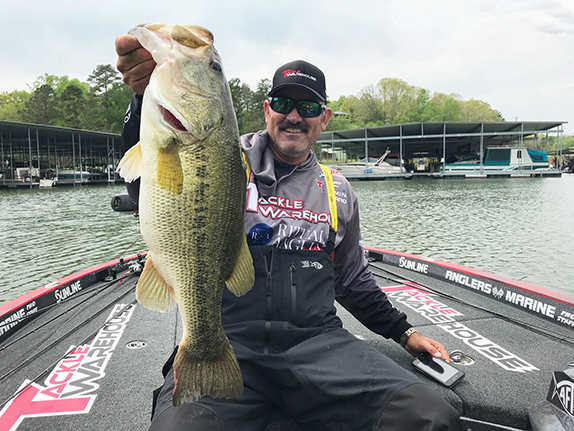 "I cut my teeth on a lot of the waters around here when I was fishing with the Virginia Bassmasters," said the former Elite Series pro who resides in Lake Gaston, Va. "The closest place was the Chick." He was referring to the Chickahominy River, a tributary of the James that's long been a tournament hot spot. Its upper reaches are usually probed by a high number of competitors in large-field events. The lower portion sees plenty of traffic as well, but normally not quite as much. The area close to the mouth of the Chick was the place Morris utilized to compile a 43-15 total over 3 days. He began the final day in 8th place, but vaulted to the top with a 16-11 stringer that was easily the best among the 12 anglers who advanced to the last round. A high percentage of his fish came from a point that he shared with legendary Japanese lure-designer Seiji Kato, who eventually finished 9th. Morris said the arrangement was beyond amicable. "We got along like champs," he said. "He's a very honorable person. He was on a drain and I was on the outside, and one of us could actually leave our spot, with the other guy staying there, and neither one of us would encroach on the other's stuff." 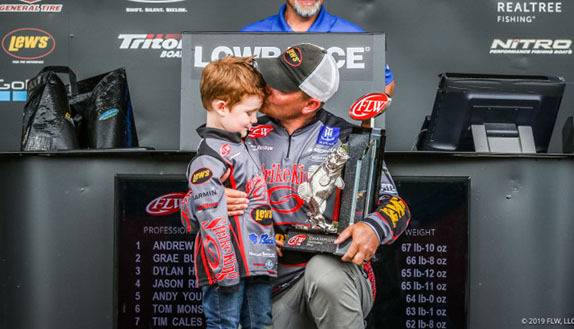 The victory will garner him his sixth career berth in the Bassmaster Classic, contingent upon him competing in the final Northern Open next month at Douglas Lake. He finished 2nd in the sport's premier event in 2006. Here are some of the specifics of how he approached the James. Morris put in 6 full days of practice for the Open, spending all but 1 of them in the Chick. "Tidal fishing is complicated and I needed a refresher course," he said. "I fished a lot of places I knew, and then I fished them again on different tides. 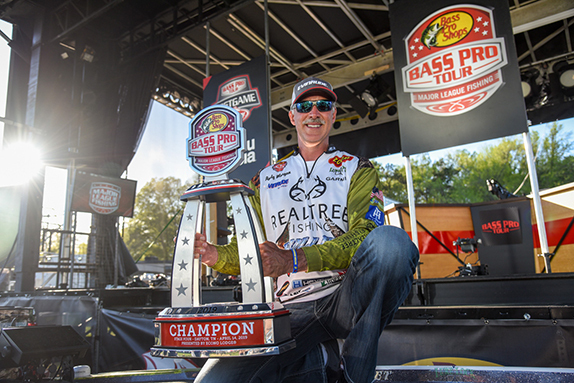 "I already knew the run to the Chick (from the launch site in Richmond, Va.) and I knew a lot of places to fish on my way back, although I never caught a fish on any of those stops (during the tournament)." He said the largemouths in the James are often referred to as being Florida-strain, but they're actually the F1 hybrid (a cross between the Florida and northern strains designed to obtain the former's growth potential and the latter's aggressiveness). One of their Florida traits was on display last week. "They were really, really finicky most of the time. In Florida, the big ones won't bite when a front comes through, and these fish are like that when they get a little stressed from pressure and heat. "When the tide was just right they'd go on feeding flurries, but most of the time they weren't aggressive. They'd just peck, peck, peck the bait or barely pick it up." Morris' program for the tournament included both power-fishing and finesse tactics. He spent a lot of time throwing a worm on spinning tackle, but also pitched a spinnerbait along outside bends in creek channels that featured deeper water and current, and threw a jig around duck blinds and sunken ships and barges. He caught a decent bag on day 1, a good one on day 2 and a massive sack (considering the circumstances) on day 3. He said the biggest factors in his final-day haul were having only 11 fellow competitors on the water with him (the original field was 158) and the apparent late start of a local tournament. "With only 12 guys, I could really stretch out and hit a few things I hadn't hit yet. Once I had a limit with a good, solid 3 1/2-pounder, I started running isolated covers that I knew and I caught a 6-pounder and a 4. "I think by the time the local tournament blasted off, I was already fishing, so I was lucky they were slow to get out. Also, it was a small tournament � if it had been 100 boats, that would've wiped me out. I wasn't fishing secret stuff � the locals know where all of it is." He used a Texas-rigged worm to pull the 6-pounder from a duck blind at about 11 o'clock. The 4, which came a bit later, was sitting next to a cypress tree that had current washing up against its trunk. That cull resulted in a 2-pound upgrade and provided his winning margin over runner-up Hamilton Jefferson. "That's where past knowledge really helps," he said of the second oversized bite. "I know a lot of subtle places that are often holding a good fish." > Worm gear: 6'10" RPM Custom Rods Dropshot Special spinning rod, Team Lew's Pro Speed Spin reel, 20-pound Gamma braided line (main line), 12-pound Gamma Edge fluorocarbon (leader), unnamed 1/8-ounce weight, unnamed 3/0 hook, various worms, all featuring a bluish tint to imitate the river's population of blue crabs. > Spinnerbait gear: 7'11" heavy-action RPM Custom Rods Okeechobee Special rod, Lew's BB1 Pro Speed Spool casting reel (7.1:1 ratio), 20-pound Gamma fluorocarbon, 3/4-ounce War Eagle spinnerbait (silver shiner). > Jig gear: Same rod and reel as spinnerbait, 60-pound Gamma braid 1/2-ounce War Eagle jig (green-pumpkin/brown), Strike King Rage Craw trailer (green-pumpkin). > Main factor in his success � "All the extra practice I put in only on the bottom of the Chick. I was only burning like 3 or 4 gallons of fuel in 10 hours." > Performance edge � "I was fishing some brush and the Lowrance Side Scan made a huge difference. Also, I needed the Power-Poles to hold the boat in the current so I could throw to the same place over and over and over. They're an absolute must in tidal water."